If you want a specific environment for your birth or are hoping for a natural childbirth, you may consider writing a birth plan. If you are planning to have a cesarean section, you can still write a birth plan as well. A birth plan lets the nurses and care providers know your wishes. You shouldn't wait until the last minute to create your plan. It takes some time to determine what type of birth you would like to have, and you never know when labor might start. There are some general guidelines for writing your own birth plan. Plans should be about one page in length and should give a concise listing of what you want during your birth experience. If you need help downloading the printable birth plan, check out these helpful tips. 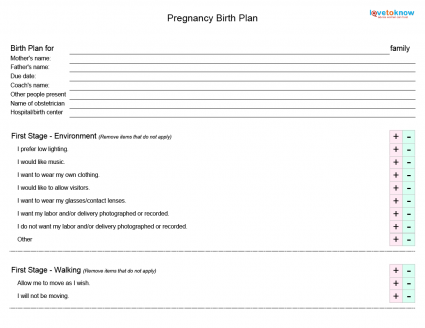 Download this free birth plan template! Before you write your plan, you should decide what type of a birth you want. Do you want a water birth or a home birth? Do you want to use a doula? Are you interested in a natural birth or do you want anesthesia? There are many options and you should decide which are important to you. Research can help you create your vision. You can tour the birthing choices that you are interested in - the hospital or birthing center - to see if they match your ideals and to see what's possible. The Internet can help clarify some of your thoughts; you can also ask your friends who have given birth to offer suggestions as well. Although you will show your written plan to your healthcare provider once you finish it, you can also have a brief discussion before you start writing. Your provider can tell you if some things are feasible - certain things may not be possible if you or the baby have specific problems. A doula or nurse-midwife may have additional suggestions. Your birth center or hospital may have a sample birth plan that you can use as a guideline. You should also include requests that cover the unexpected. Make provisions in your birth plan in case the delivery does not go as planned and you need a cesarean section; you should state what type of anesthesia you want during a c-section. If you are giving birth at home or in a birthing center, you should also indicate your emergency plans like transportation to the hospital. Write your plan at least a few weeks before your birth so you can take it to your care provider for review. After the provider reviews it, ask him or her about your chances of getting what you want. You may have written on your plan that you want a water birth, but your care provider may not do water births or your birthing facility may not have the equipment for a water birth. Your provider can also tell you if one of your requests may not be possible due to health concerns. By taking your birth plan to your care provider before your labor, you can head off miscommunication or unnecessary disappointments during the birth process. After discussing the plan with your health care provider, it is very important that you go over your birth plan with your birthing team. You may want a natural childbirth, but your mother may think you want an epidural. You may not want an IV, but your father may not understand why you wouldn't want one. Going over your plan with your team will eliminate hurt feelings and potential arguments during childbirth. In addition, you may be expecting each member of your birthing team to have a job or something you plan for them to do. However, the members of your team may have other ideas. Before you go into labor, take the time to discuss the birth plan as well as your expectations for your birthing team. If you know you are having a c-section, you can still write up a birth plan. You may not need to discuss birth positions or use of an episiotomy; however, there are items that you can control about even a c-section birth. What type of anesthesia (spinal or epidural) do you want? Use of mirrors - do you want to see the baby coming out? Do you want to hold the baby immediately? Do you want to breastfeed immediately? A cesarean birth plan may look a little different than a natural birth plan, but they both share the same purpose. Both can give the mother as much control as possible over the type of birth experience she wants to have. While you write your birth plan, remember to be flexible; your birth plan is primarily a communication tool. You have dreams and hopes for your birth. You may be hoping for a completely natural childbirth, or you may be hoping not to be induced. But birth is unpredictable, and it cannot always be controlled. A medical condition may require an induction. Your baby's health could be compromised, requiring a cesarean. If your birth experience does not go according to plan, it does not mean that you failed or that you had a failed birth plan. Sometimes in the course of a birth, the plan needs to be altered for the health and safety of the mother or the baby. As long as everyone comes out healthy, you have a successful birth plan.